Space Systems Operations Management (SPSM) graduate students in Colorado Springs Michael Felix, William Eastburn, Nicholas Schlatter and Scott Gebers are examining the state's current emergency response actions and identifying what key UAS assets exist. 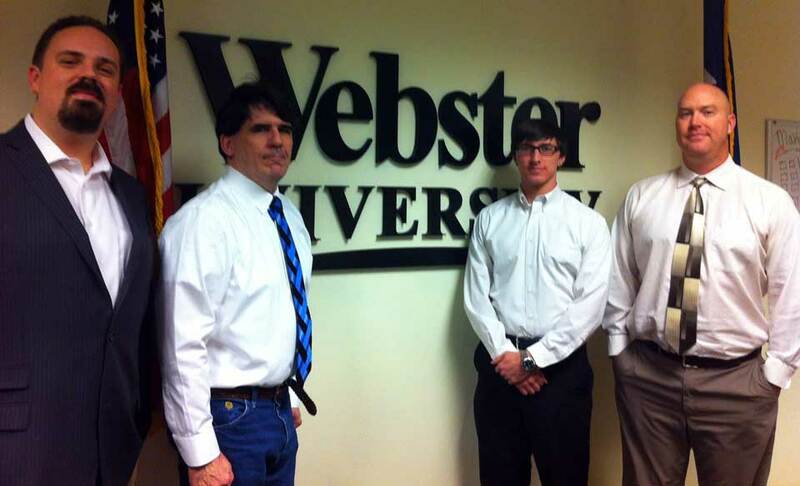 Four Webster graduate Space Systems Operations Management (SPSM) students at Colorado Springs are supporting practical research on the use of Unmanned Aerial Systems (UAS) during state emergencies. Valuable technological resources go unused due to political and regional oversight restrictions when state and federal agencies are engaged in handling escalating emergency responses. In Colorado Springs, students William Eastburn, Michael Felix, Scott Gebers and Nicholas Schlatter are examining the current emergency response actions and identifying what key UAS assets exist in Colorado. In response to a request from the Chairman of the Board - UAS Colorado, these students are also producing a smart book detailing Colorado based UAS asset technical capabilities, and will draft a proposed Concept of Operations (ConOps) streamlining the handoff of UAS lifesaving assets from city, county, state and federal incident commanders.